I might as well get to the biggest news of the past few months. In my July letter I talked about how I’d managed to exercise my way into a bit of a relapse with my chronic fatigue issue. Well things sort of snowballed from there in the months after that letter was written. As July progressed I began to experience some difficulties with my breathing, particularly when doing something physical (now, now. stay out of the gutter … you’re liable to step on me). I’ve never professed to be the most gifted athlete in the world, certainly from a cardio-vascular standpoint; marathon runner I’ll never be, not now nor when I was young and healthy. But when I half-ran/half-jogged (scooted?) to catch a bus one day, a mere hundred metres or two from the house, and found myself needing to get on a knee to catch my breath I knew something was amiss. Oh Goody! Swollen Lymph Nodes in my Chest. I went to my family doctor to get this new, somewhat scary symptom checked out. After the usual poking and prodding and debriefing the doctor had a chest x-ray ordered. A few days after the x-ray I was rewarded with a phone message from my doctor telling me that the lymph nodes in my chest were swollen and that she was booking me for a CT scan and a referral to a respirologist. I’m no doctor but that didn’t sound good. And it was certainly different than the usual negative results I’d gotten on the myriad tests I’d undertaken since my fatigue problems began in 2002. So like anyone these days I headed to the internet to do a little research on swollen chest lymph nodes. With modern technology I can pretend that I’m a doctor. Perhaps I was a tad naïve, but looking this symptom up online, while alone, was an unfortunate decision since the three most prominent causes of swollen chest lymph nodes are Tuberculosis, Lymphoma, or Sarcoidosis. Presumably like all of you just now, my brain zeroed in on that big CANCER revelation and it started racing. For the first time in my life I was actually afraid I was going to die. Not in a subconscious, vague awareness of mortality sense; in a holy crap I’m going to die and soon sense. It was not a pleasant feeling I can assure you. I held Sophie and I cried. That’s my chick flick moment for this letter. It shows my sentimental side and hopefully has all the women angered by my chauvinistic ‘hot mom’ bit earlier in the letter suddenly conflicted by the flutter in their hearts caused by this ‘man enough to admit he cries’ eye-opener. 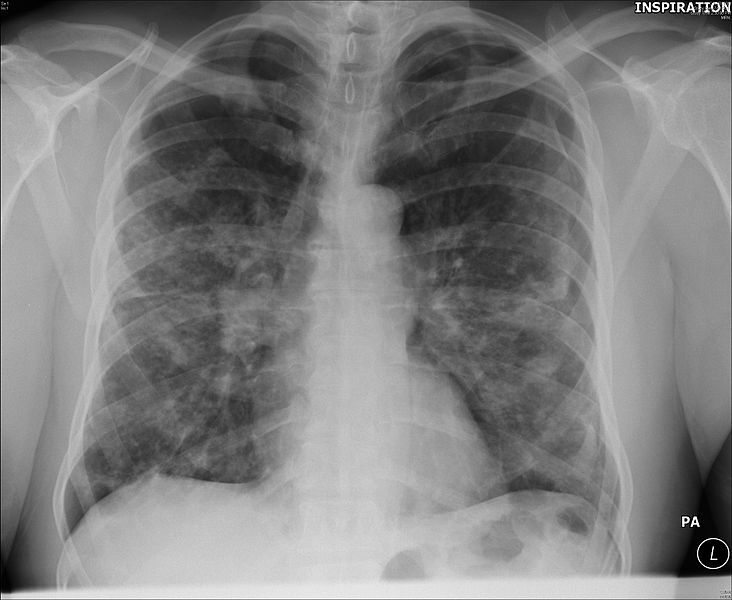 The CT scan and subsequent lung biopsy confirmed the respirologist’s suspicion that I have Pulmonary Sarcoidosis. This is a much more welcome diagnosis than Lung Cancer, certainly, but it’s not one without its own dangers and implications. I don’t get to take a pill for a few weeks and end up cured ready to scoot to bus stops with nary an increase in my pulse. I’d even venture to say that in some ways it’s even more frustrating than having cancer since nobody knows what causes Sarcoidosis or how to cure it. Mortality rates for Sarcoidosis are negligible compared to lung cancer so don’t get the impression I’m hugely relieved. It’s just that I had been frustrated by my health for so long I hoped a definitive diagnosis would go hand-in-hand with a treatment and a cure. Sarcoidosis is a mystery disease for which treatment primarily involves minimizing the ill effects of symptoms. As scary as cancer can be, at least there is a treatment, ugly though it may be, that actually fights the disease and can sometimes be quite effective at eradicating it. Just sitting around hoping something goes away or fails to worsen doesn’t give me much comfort. In many cases, Sarcoidosis just disappears in a year or two. This happens quite often for people with Stage 1 Pulmonary Sarcoidosis which is what the respirologist tells me I have. For others with the disease, it progresses through Stages 2, 3, and 4 which means the disease starts inflicting serious damage to the lungs and even begins affecting other organs. As you can imagine, this has the potential to pose some serious problems, even death, so I’m lucky that I’m in the least dangerous category so far. I’m hoping it stays that way! One complicating factor in my treatment, oddly enough, is the chronic fatigue problem I’ve dealt with for the past 6 years. Fate’s perverse sense of humour is at play again since the chronic fatigue symptoms that I’ve been suffering are identical to some of the symptoms used to diagnose a worsening of Sarcoidosis. So, if these symptoms flare up or get worse it will be impossible to know whether it represents a worsening of my Sarcoidosis or if it just represents and flare up with the fatigue nonsense I already have. Hey, why do things the easy way. In fact, the respirologist mentioned that there is a slim chance that the 6 years of fatigue and whatnot was actually low grade Sarcoidosis bubbling away and it has now become full blown Sarcoidosis. An interesting possibility since it would give me a legitimate diagnosis for all the crap I’ve been going through since my 30th birthday threw my life into convulsions. The downside to such a possibility is that if I indeed have had Sarcoidosis for six plus years, it obviously isn’t going to spontaneously disappear in a year or two and will likely be something I’m going to deal with for the rest of my life. Now while all this fun is going on, my doctor had also referred me to an Internist which I think I described in my last letter as a Dr. Gregory House type of physician. This was a referral I was thrilled to be getting and wish I’d had a few years ago. I just couldn’t accept that I was perfectly healthy but had a bit of chronic fatigue and/or fibromyalgia as my family doctor believed. Besides, the associated back pain and eye pain I’d been suffering for a couple years now didn’t 100% fit the diagnosis my doctor had given; vague as it was. And let’s face it, a wee part of me was hoping I’d walk into this Internist’s office, he’d diagnosis me with something not too common but not too dangerous, pump me full of drugs thereby inducing new symptoms far more serious than those I had initially, realize the diagnosis was incorrect, reassess based on the new symptoms, conduct several invasive tests on my deteriorating body, diagnose me with something far more sinister but still treatable, pump me full of more drugs again inducing further and more frightening new symptoms, again reassessing the situation before a completely unrelated occurrence triggers the realization that I in fact have a unbelievably obscure but easily treatable disease for which a few hours of intra-venous drug therapy will cure me completely and I’ll be back to normal the next day. Unfortunately, life is not a TV show and such a progression of events rarely happens. The Internist is quite convinced that I have indeed had Sarcoidosis for the past 6 years and that all my various symptoms have resulted from this one cause. He’s sending me to have a bunch more tests to make sure things aren’t spreading to my other organs and to confirm his suspicions, I guess, but he seems pretty sure that’s what’s been going on. So my hope for a magic diagnosis and cure did not come to fruition, but I am somewhat pleased to now have a diagnosis for all that’s happened to me. Sadly, it looks like I’ll be dealing with this for possibly ever which isn’t the most uplifting news. October was a good month and I felt pretty good but November has seen things regress a bit. I can do things, but I won’t be wowing the crowds at the hockey rink anytime soon. I’m taking a couple asthma inhaler drugs to help with the breathing symptoms but I don’t think they’re doing much. It’s not like I’m gasping for breath all day, I just find my chest a bit tight and I need to take deep breaths once in awhile. Climbing up stairs means I need to pause a few seconds to kind of catch my breath. It’s not fun but I’m not incapacitated. I’m just forced to alter my lifestyle and life-expectations a bit. For example, it’s probably a good thing that the moms at playgroup aren’t all amourous, single supermodels since I likely couldn’t handle the elevated breathing rate! And yet, even in the midst of news like this, there are nuggets of wonder and self-discovery to be learned. As part of diagnosis and monitoring, I have to take breathing tests to see how much my lung capacity is being diminished by the disease. Last week I went in for a 3 month update test and my lung capacity has actually improved from August which is great news. It was also revealed to me that I have an above-average lung capacity to begin with. The doctor said it’s quite an impressively large lung capacity, actually, which surprised the hell out of me since I always sucked at cardio exercise. He says that having this large lung capacity is likely helping me deal with the disease better than most since even though I am losing some capacity I had more to begin with. In other words, I’m kind of a sick superhero. But more importantly, you all can now say I truly am full of hot air! This was edited in April 2014 from its original that was first published as part of my Christmas 2008 letter. My (this is just a figure of speech) Sarcoidosis is pulmonary like yours. It’s no longer actively spreading in my lungs, but I’m deteriorating. Breathing is difficult, painful and a chore. Sleeping happens when it happens, eating is the same. I also have chronic, Asthma just to complicate things and is at the high end of seriousness. Both these diseases are making my life a living nightmare. I came out of a 4 day stay at hospital last week, it looks like I will be going back there again very soon. My breathing is getting worse, the Symbicort and Ventolin is failing and the Prednisolone is all but left my body. Only the side effects remain. I am just now reading this amazingly, witty, personal account of your experiences. Wow. First off, I am so sorry you had to get such scary news. It is not the best news but I hope you are thriving nonetheless. Secondly, you have such a funny and engaging writing style. It made me laugh several times and tear up. Thank you for sharing this story. I am going through my own debacle with health care and trying to get to the bottom of chronic fatigue, and swollen lymph nodes all over my body. The part about Dr. House was so entertaining! If only we could go through that sequence only to find out it was a simple fix and be fine after an IV of flinstone vitamins or something. LOL. The thought that you had to endure for 6 years without answers is brutal. Wishing you the best. Thank you, again, for sharing your story. My Marriage Proposal: It’s The Thought That Counts, Right?